As ASICS expands and becomes increasingly global, the company is going through the transformation of its European business, which includes streamlining and taking greater control of its supply chain. Key elements that needed to be resolved were the lack of real-time visibility and control of the stock, as well as space utilization and too much outsourcing to external warehousing. 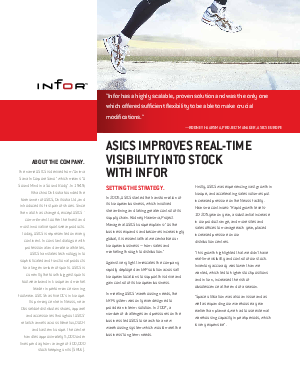 By implementing Infor WMS, ASICS achieved the following benefits: knowing precise stock position at any time, productivity increase of at least 6 days a year, and greater flexibility and agility through redeployment of stocks in different DC’s matching demand.